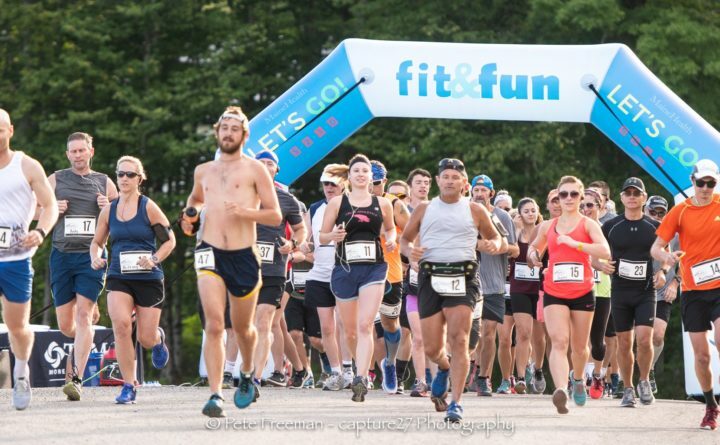 MARS HILL — More than 40 runners from Maine and New Brunswick enjoyed the sweeping views around Bigrock Mountain during a half marathon event held Sunday morning, Aug. 12, by The Aroostook Medical Center and Bigrock Mountain Ski Area. The tremendous positive feedback from the runners on both the course and the event has already led organizers to plan for this to become an annual event. The first finisher of the Big Run Around the Mountain half marathon was Thomas Wire of New Limerick, who ran the 13.1 miles in just 88 minutes (1:28:07). The first female finisher was Katie Malone of Caribou, with a time of 1:41:19. Forty-two runners completed the race. The Big Run Around the Mountain was the brainchild of Jamie Guerrette, TAMC’s community health specialist, after she was approached by the ACI & Central Aroostook Homecoming Committee about putting together an activity for Mars Hill Homecoming Weekend. Guerrette leads the hospital’s Fit & Fun program, which brings activities to the community for children, families and adults to encourage physical activity. The goal is to lower obesity, particularly in children, by promoting a more active lifestyle for the whole family. TAMC partners regularly with Bigrock, particularly around winter ski programs. When Guerrette reached out to Travis Kearney, Bigrock manager, he was quick to agree to partner on the Big Run Around the Mountain. The potential for serious runners to train and for less experienced ones to test their limits in an affordable way were both significant draws to the Big Run Around the Mountain according to feedback from the runners themselves. Jacob Boone, second place finisher, traveled to the area from Old Town to run as part of his training for the Maine Marathon on Sept. 30 in Portland. Similarly, Andy and Brittany Grass of Blaine and a number of others took on the course in preparation of the Caribou Marathon on Sept. 16. The event also saw several first time half marathoners, including Lisa Lorenzo of Presque Isle and Carla Haines of Caribou. Lorenzo ran her very first 5K on Saturday during the Color PI event and then went on to tackle her first half marathon on Sunday. Lorenzo, who works on the food services staff at TAMC, was joined by Haines, her manager. The two are already making plans to next run in the Colors of Courage 5K/10K being held by TAMC on Sept. 29. For brothers George and Carl Bradbury, Sunday was a chance to enjoy a beautiful morning together while getting some exercise. The duo took on the course, keeping each other company throughout. George, of Bridgewater, edged out Carl, of South Portland, by just a tenth of a second going across the finish line. The event also included a free Kids Fun Run and a free pancake breakfast. Another fun aspect of the day was cheer stations set up along the route. TAMC partnered with the Mars Hill IGA to sponsor a cheer station contest to encourage those who live along the route and others in the community to come out to both cheer on the runners and provide a water break along the course. More than a half dozen people set up cheer stations along the route, and earning a $100 gift card to the IGA for the winning station was Kim Fields of Mars Hill. “It was great to see so many families set up along the race course handing out water, Gatorade and words of encouragement,” commented Grass regarding the cheer stations.